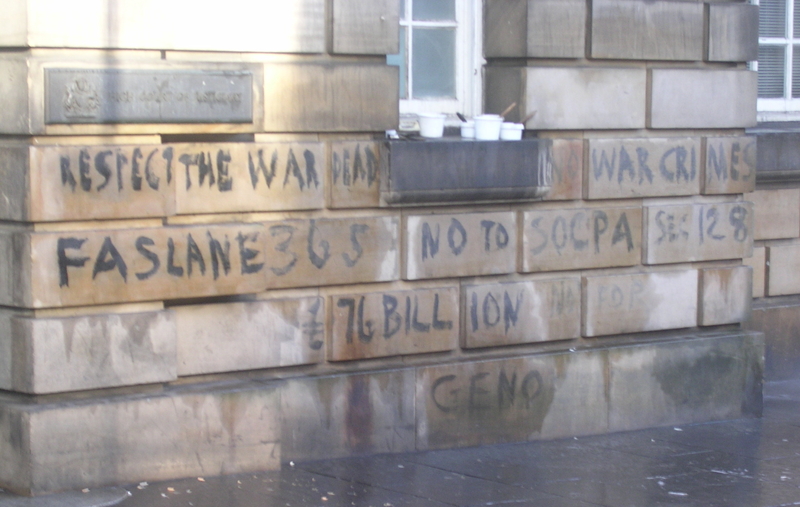 Georgina Smith and Helen John painted “Genocide”, “NO More War Crimes”, “No Upgrade”, “Respect the War Dead”, and “Art, Law, Morality” on the walls outside of the High Court on Edinburgh’s Royal Mile on Remembrance Day 2006. The action was a protest against the High Court’s complicity in the illegal deployment of the genocidal nuclear weapon system by ruling it legal in the Lord Advocates Reference of 2000. In addition their action condemned the Scottish legal system for holding people who blockaded during Faslane365 for up to thirty hours before releasing them without charge. Georgina is a veteran anti-nuclear campaigner who took part in the decade long women’s encampment at Greenham Common which ultimately ended when US Cruise missiles were removed. The painting was part of the year-long Faslane365 campaign in which over a thousand people were arrested for blockading Faslane Naval Base, homeport of Trident, the UKs nuclear weapons system. At the time of the original action the two women released a statement which read: The “arrest and detain for 30 hours without charge” policy amounts to an abuse of process designed to silence legitimate protest against upgrading genocidal Trident nuclear missiles. NO More War Crimes”. 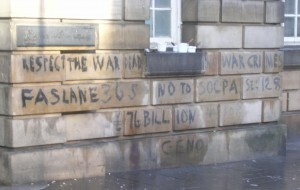 The government continues to deploy Trident submarines, each carrying 48 nuclear warheads. Each Trident warhead is 8-10 times the size of the Hiroshima bomb, the use of which would inevitably kill hundreds of thousands of civilians and untold environmental devastation. Letters may be sent to Georgina Smith at the address listed on the Nuclear Resister’s Inside & Out page.